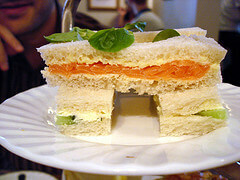 World renowned Betty's Café Tea Rooms of Yorkshire, England is a place full of tradition, history, and elegance. The first location opened its doors in 1919 and today the only locations are in Yorkshire, England to ensure that the quality of service and foods stays unique and special to the Yorkshire area. Interestingly, a mystery lies within the Café's title… no one knows who Betty was! You can stop by Betty's for breakfast, afternoon tea, or sit down for a full meal and choose from the menu items inspired by Swiss and Yorkshire cooking. At each of the six locations there is also a shop that sells famous swiss chocolate, breads, coffee, cakes, and teas. All of Betty's Café products are made my hand and are often times sourced locally. Bettys is the place to go for breakfast, tea, or a meal in a relaxed and elegant atmosphere. Last updated by Elyse Boykin on 10 May, 2010 in Food And Drink.